Returning back to its previous label Tooth and Nail like the prodigal son, Orange County God-rockers Project 86 have re-released Songs To Burn Bridges By with stunning artwork and three new tracks, breathing new life into the record. Sounding like a cross between POD, Papa Roach, and Boysetsfire, this foursome play the kind of straight-laced hard rock whose purposeful yet frustrated screams and thunderous riffs seem to have a more reflective aura than most other bands lack. Even though the outfit has eight years under its belt and is revered as a Christian rock group, there's a whole lot of commercial rock creeping inside cuts like the sinewy groove of "Say Goodnight to the Bad Guy...", no doubt coming soon to a PS2 game soundtrack or beer commercial near you. 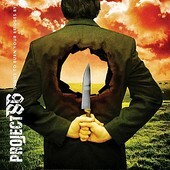 Project 86 has the arena rock stomp down pact; now all they need is the masses to embrace its play it safe strategy.